WASHINGTON — President Donald Trump said he would meet with North Korean dictator Kim Jong Un by May to achieve denuclearization, South Korean National Security Advisor Chung Eui-Yong said Thursday in a short statement outside the White House. The stunning agreement to meet came after North Korea pledged to refrain from further nuclear tests during negotiations. In recent talks with South Korea, North Korean dictator Kim Jong Un “expressed eagerness to meet President Trump as soon as possible,” the South Korean national security advisor, who briefed Trump Thursday, said. The South Korean delegation also delivered a letter from North Korean dictator Kim Jong Un to the White House Thursday, a senior U.S. official told NBC News. The South Koreans were at the White House Thursday to brief U.S. National Security Advisor H.R. McMaster and other top officials on recent talks with the North Korean regime. News of the letter comes amid promises from President Trump that a “major statement” on North Korea would be coming from the White House Thursday night. The president made a spontaneous stop into the White House press briefing room Thursday evening to tell reporters, including NBC News, that an announcement on “the big subject” — North Korea — would be coming from South Korea that evening. Trump said then that he had spoken with South Korean President Moon Jae-in. South Korean National Security Advisor Chung Eui-Yong is expected to brief reporters from outside the White House. Earlier this week, Pyongyang signaled its willingness to hold talks with Washington on denuclearization, saying it will suspend its nuclear tests while talks are underway. Asked about the developments earlier this week, Trump expressed optimism, saying he believed overtures from the North Koreans were “sincere,” attributing them to “very, very strong” sanctions and increased pressure from China. Since July 28, 2017 North Korean dictator Kim Jong-Un and President Trump have exchanged ever more heated threats over North Korea’s rapid development of nuclear weapons that could strike the U.S. mainland. Here’s a timeline of events that have moved the two nations closer to confrontation. July 29: Kim said the latest missile test shows that his country can hit the U.S. mainland. The view is shared by U.S. analysts who say a stretch from Los Angeles and Chicago now appears technically within range of the North’s weapons. Aug. 1: Secretary of State Rex Tillerson said the US does not seek a regime change in North Korea and would agree to a dialogue with the secretive nation if it abandons its nuclear weapons program. Aug. 2 Uranus (29 Aries) stations retrograde : The U.S. Air Force successfully test-launched an intercontinental ballistic missile from the California coast. The unarmed Minuteman 3 missile was launched from Vandenberg Air Force Base, about 130 miles northwest of Los Angeles. It was the fourth such test this year. 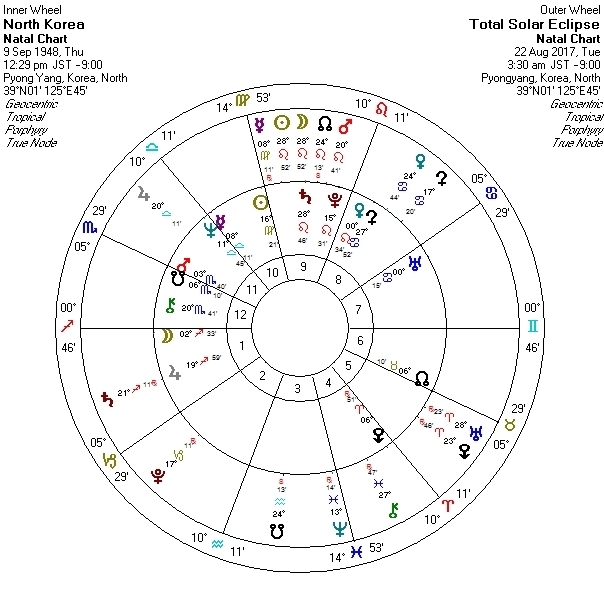 Aug. 5: The United Nations Security Council unanimously approved tough new U.S.-drafted sanctions against North Korea that include a ban on coal and other exports worth over $1 billion. Aug. 6: China’s foreign minister urged North Korea to halt its missile and nuclear testing one day after China and Russia joined with the United States in the U.N. sanctions vote. 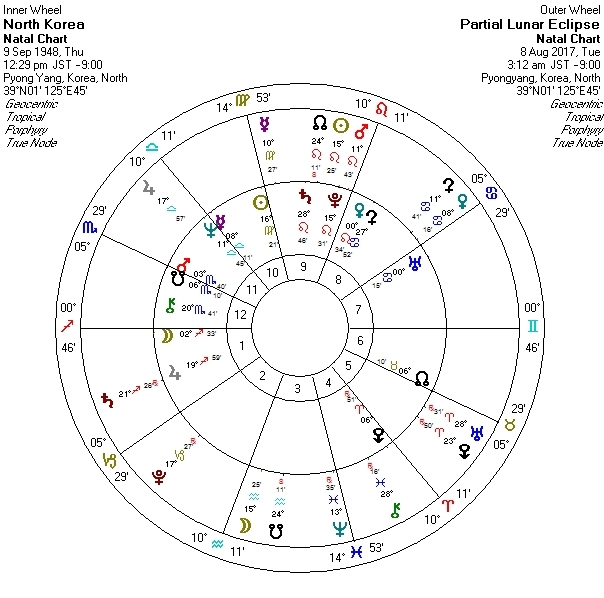 Aug. 7: Lunar Eclipse (15:25 Aquarius; trined by Jupiter in Libra) North Korea responded to the sanctions by saying it would launch “thousands-fold” revenge against the United States. Aug. 8: Trump lashed out at North Korea. saying the rogue regime risks “fire and fury like the world has never seen” after the Washington Post reported that the communist nation has produced a miniaturized nuclear warhead that can fit inside its missiles. Aug. 9: North Korea threatened a missile strike on the U.S. territory of Guam in the South Pacific, where the U.S. has military installations, according to South Korea’s Yonhap News Agency. 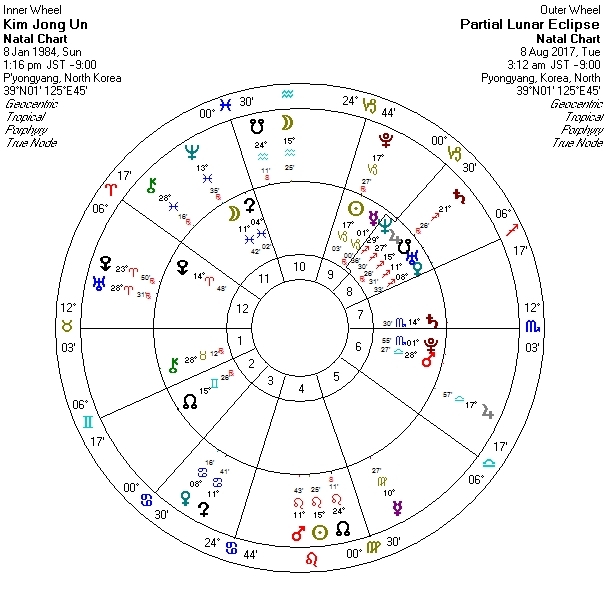 Above Chart Notables: ** Kim Jong-Un’s birth date and time are under question. I am using 1984 based on information from a relative who said their children played together.